Tom Weiskopf has built a reputation for unprecedented service that he provides to his clients. His objective is not only to help his clients meet their real estate goals, but to exceed their expectations. Real estate is more than a profession for Tom - it's his passion! His unwavering commitment, attention to detail and proven negotiation skills gives his clients confidence in knowing their interest are his only priority. As a top Scottsdale listing agent and Fountain Hills listing agent, Tom Weiskopf and his team develop a marketing plan that is customized to each unique home. No two properties are alike, and the marketing strategy needs to be tailored based on the competition currently available. Tom's seller services give maximum value for each property. For buyers, Tom's market knowledge and extensive experience in negotiating the best possible deal gives buyer's a tremendous advantage. No search is too extensive and he is committed to doing what it takes to find the perfect property. And, he provides the necessary strategy to ensure the offer stands out receives full consideration. Raised in Colorado and Wyoming, Tom began his career in the hospitality industry where he held a variety of senior level positions in sales and marketing with city center hotels, upscale resorts and luxury independent hotels. His passion for reaching out and helping others attracted him to the healthcare industry where he served in executive level marketing, communications and public relations capacities focusing on health promotion and disease prevention both in the corporate and non-profit sectors. No stranger to relocation, Tom has lived in a variety of places, on both coasts and many stops in between. "I feel fortunate that my career enabled me to relocate and experience the great diversity this country offers, but Arizona is what I now call home", he says. Tom came to Arizona in 2002 and decided to further pursue his real estate interests and left the corporate world to devote his full time to residential real estate. Tom is a member of the Scottsdale Area Association of Realtors, the Arizona Association of Realtors, the National Association of Realtors and the National Trust for Historic Preservation. He began practicing real estate full time in 2005 and have been a consistent top producer ever since. Considered a best Scottsdale Realtor and best Phoenix Realtor, Tom has been awarded with the Coldwell Banker International Bronze Society and the venerable International Sterling Society designation, a member of the relocation team of Cartus Broker Network and Certified Agent Advantage Specialists. Tom has been featured in Ranking Arizona, a publication of the AZ Business Magazine, the who's who of Arizona real estate, including the #1 position in 2009, and has been a frequent resource for the Arizona Republic and Wall Street Journal. Tom has discovered the joys of investment property as well and own rental property in Phoenix, Tempe and Prescott, AZ. He has two grown children and is an avid horseman, enjoys travel, hiking, cultural attractions, fine dining, wine and historic homes. He resides North Central Phoenix. Tom has established a reputation of providing unsurpassed service, attention to detail, and an unwavering commitment to exceeding my client's expectations. His strong negotiating skills and marketing experience puts his clients in the best possible position for buying or selling a home. 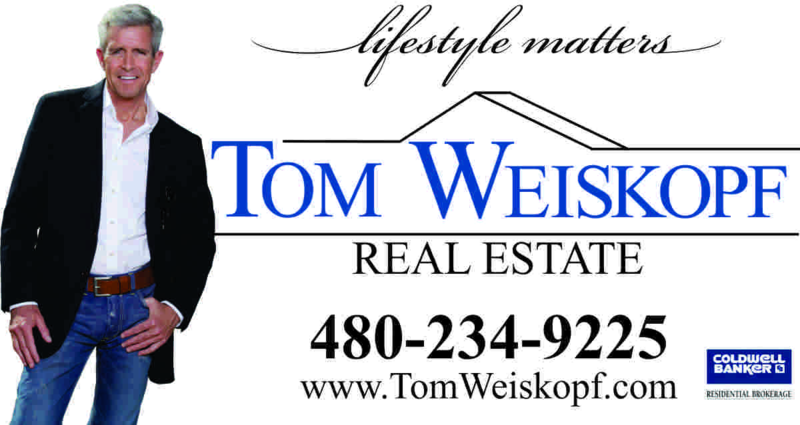 Thank you selecting Tom Weiskopf, PLLC, the premier Phoenix realtor for your real estate needs. Serving Scottsdale, Phoenix, Paradise Valley, Carefree, Cave Creek, and Fountain Hills, achieving your real estate goals are now within your reach. If you are considering buying or selling a home and are looking for a premier Phoenix/Scottsdale realtor, or would just like to receive additional information, call or e-mail Tom Weiskopf today.